With a talent for blending lyrical substance, musical depth and midwestern sensibilities, the music of Jamestowne is instantly accessible. Since the band's genesis, their focus has remained true to the ideal that becoming skilled songwriters is key to the creation of their sound. "We try to concentrate on story-telling and on keeping things simple--- things that people can relate to, without fancy bells and whistles and gimmicks," explains lead vocalist Jimmy Mastandrea, who is one of the band's principle songwriters, along with guitarist Kip Theno. Taking inspiration from every day situations in real life, Jamestowne strives to offer insights and infuse positivity into the perspectives of their songs. "I usually use verses to create a scenario and a chorus to offer a solution." Feeling that people often relate best through drama, they incorporate a balance of light and dark, positive and negative, while trying to avoid typical cliches. "The rule of thumb is that if you can predict the word that is coming up that someone is going to rhyme it with, then it is a cliche." While the writing process is one that comes and goes in phases, usually Jimmy and Kip will come up with a musical idea, like a blueprint, for what style of song they would like to write. Then, Jimmy goes back and writes the lyrics, sometimes drawing from different random thoughts he's previously captured on paper. 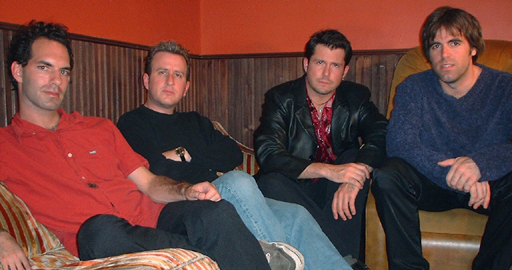 After the release of their self-titled cd in 1999, the line-up of Jamestowne changed to evolve into their current incarnation with Chicago, IL native, Jimmy Mastandrea on lead vocals and acoustic guitar, Indianapolis, IN native, Kip Theno on electric guitar and vocals, Neil Sebba, hailing from South Africa, on drums and Tom Alexander of Sherman Oaks, CA on bass and vocals. Taking their name from a lyric in John Mellencamp's song Minutes to Memories, Jamestowne began in 1995 when Jimmy and Kip, who were high school classmates, moved to Los Angeles. In the early years, they started out playing acoustically in coffeehouses and later decided to form a full band. "We just played some shows and kept writing more and more songs until we had enough to record." For the making of their cd, they worked with producer James "Jimbo" Burton (Rush, Third Eye Blind, Sting, Crowded House) and Mike Reilly. Their songs have been featured on radio shows that highlight local LA music, like KLOS's Local Licks, and in March 2000, MTV's Undressed used five tracks from the album in two consecutive episodes. Another thrill for the band came in October 2000, when the WB's Felicity used two Jamestowne songs, Perfect World and Disheartened, in an episode. And, they were honored to have the chance to represent California in last year's Sam Goody Bandemonium regional finals where they came in first out of eight hundred bands. While the band has an appreciation for both writing and performing, they enjoyed having the opportunity to tour the midwest with Brian Wilson and Paul Simon on the Levi's First Stage this summer. Having a chance to play for audiences of all ages and in various parts of the country, they noticed that different people are moved by different things in their music. While older crowds tended to enjoy the ballads more, the younger people preferred the faster songs. One special and almost surreal moment happened in Columbus, OH. "It was our last show and we had just played twelve shows in nine days and we were exhausted." As if the sky were a metaphor for the occasion, the weather had been overcast until they began playing the first chorus of Don't Mind Saying. "We saw the sun crashing through the clouds and I looked up and it was like this is too majestic," said Jimmy enthusiastically. "It felt like we had accomplished out what we set out to do and now when I hear that song, it brings me back to that point. It is one of my favorite songs to play live." During their time in Indianapolis, IN, Jamestowne appeared on FOX 59's The Morning Show and performed two new songs, Don't Have to Be and Not That Simple, both of which will be on the next cd that the band is currently working on. "I'm hoping people will like the music on the next cd as much as the first one." In addition to writing and recording for the next album, Jamestowne plays regularly throughout southern CA, including frequent shows at Brennan's in Marina del Rey (4089 Lincoln Blvd). When describing the feeling of playing live, Jimmy said, "we just have so much fun." Dates for upcoming shows can be found on their website: http://www.jamestowne.net. While Jamestowne has years of hard work behind them, their bright future is just getting started. Perhaps, Jimmy Mastandrea sums it up best. "I think the bands that are successful are the ones that don't give up and are still going. Success is knowing that you're doing something that you love."